Here’s what happens when you have to drive at 4:30 in the morning out in the mountains and forests of upstate NY. You start to freak out. It happens slowly. Since you’re alone on the road, you think about the people who might be hiding in the forest surrounding the winding road you’re traveling on. It’s a 12 minute ride from my house to the highway, and even with SiriusXM blasting, I am counting the seconds. And then, at the first deserted intersection, there’s a car. Who could possibly be driving at 4:30 AM? And why are they following me? I speed up, he speeds up. I slow down, his brights blind me. Is it a cop? If it is, theres no way I am stopping. It could just be a random guy with lights attached to his car that the psycho behind the wheel uses to pull over unsuspecting drivers at 4:30 AM. If those lights start spinning and I hear sirens, I’m flooring it. Cavorting deer and skunks be damned. I realize it must be a serial killer. Even though I’m also a random driver out at 4:30 AM, I know that I’m safe. That means that driver number two is clearly unsafe. I glance at WAZE, glowing warmly from my phone. No other WAZErs online. Obviously. Who would be out at 4:30 AM? The car behind me speeds up and illegally passes me. I don’t see anyone in the front seat. Probably because there is no one driving the car. It’s a ghost car. No question. And that’s when it hits me that to get to the highway, I need to pass the haunted house. There is a legit haunted house on the road that I pass virtually every day. 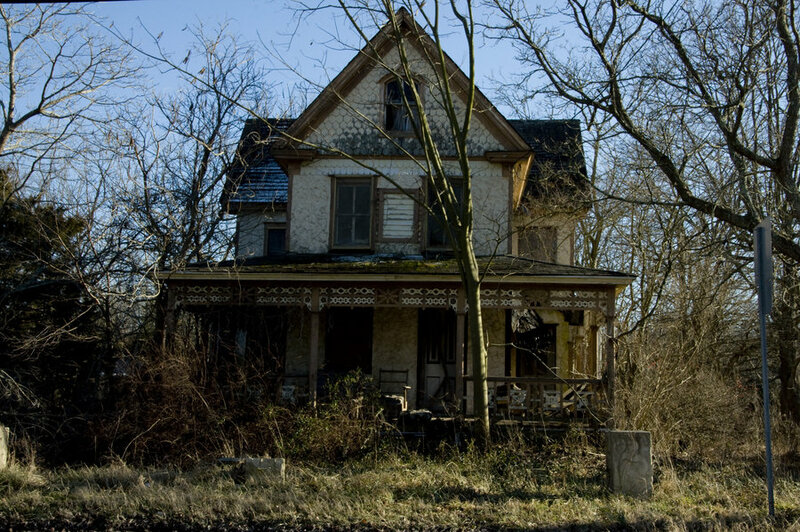 It’s an abandoned house that falls further and further into disrepair each year. And each year that I come to this wilderness, I swear that I will explore it. But I haven’t yet. So now, at 4:30 AM, I know that whatever is living in that house will no doubt make an appearance in the middle of the road as I pass. And by the way, I’m using the word “living” in the loosest sense of the word. Probably a woman dressed in black rags, holding her hands high, blocking the road. Pale white face. Large bloody grin. No pulse. Like this lovely woman. But scarier. I start looking for the serial-killer-ghost-police dude. His taillights have long since pulled away from my field of vision. I switch the radio station from The Pulse to On Broadway. Phantom of the Opera is playing. Great. I switch to Howard Stern. It’s just the news. Not that funny. I’m passing the house soon. I concentrate on the road in front of me. Not the forest. Not the creepy house looming out of the corner of my eye. Not the movement I swear I see in the forest. I just look straight ahead. Why is there so much fog?? What is it with the mountains at night?? And then, I see lights. I never realized how comforting a Walmart sign can be at 4:30 in the morning. But there it is, shining like break of day. The entrance to the highway is right around the corner. I stop scanning on Sirius and settle back on The Pulse. (Great station there, by the way.) I get on the highway and get comfortable for the two hour drive ahead of me. A drive with no ghosts, no creepy ladies, no haunted houses. And there, on the side of the road, a little off the exit, is the ghost-serial killer-cop dude. With a state trooper. Hah. Should’ve stayed with me instead of racing off. In the last three days I’ve had my first experiences with the upstate NY roads and hills. I wouldn’t drive those in the dark for anything! That was fun…I was hooked…Oh GOD someone is behind me…that’s not just a hook…thats a ……..